For when you want to get serious in the kitchen, The Culinary Institute of America brings their power of cooking knowledge to you via your iPad. The book is nothing short than ‘incredible’… according to the couple of folks in the office that can cook. For the rest of us, they tell us there the ‘cookbook’ is all about educating us to be more kitchen skilled. 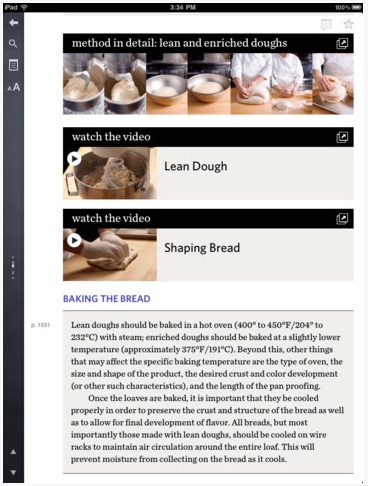 The full Culinary Institute of America iPad book contains over 750 photos, 175 diagrams, 850 recipes and 100 video lessons. The whole experience is divided into 36 chapters and will take over 400 mess of your iPad’s memory. We are talking a kitchen teaching tool and meal enhancer. Each chapter has an exam to see how your doing with lessons learned. And, you can actually takes notes throughout the book rather than those old card stock 3×5 cards your mom had to use. Highlighting is also supported. There is even a social side of this iPad book, which is always a hit with us. You can share out via email or Facebook. Search is supported within, as well outward to Google or Wikipedia. If this was a paper book, without interactions… without video, or lesson plans, or social sharing or the ability to notate without destroying the paper, we wouldn’t think a $50 price tag was excessive. But, people have come to think of interactive apps on the iPad as being less expensive than their physical counterparts so the book can actually be purchased a chapter at a time. Just like mom used to do with her monthly Betty Crocker Cook Book Subscription. Rather than doing a one time purchase of the full Culinary Institute of America iPad app, you can download the free iPad Inkling book app. You can buy the first introduction chapter of the Cook Book for (currently) $2.99, then each chapter for $3.99. This means you won’t have end-to-end lesson plans but it is nice if you have no interest in certain meal types or would rather not have chapters on particular ingredients.